Vision Films, a worldwide distributor of independent feature films, documentaries and music programming, has announced today that they have picked up international sales rights to The Identical, the musical drama directed by Dustin Marcellino and starring Blake Rayne, Erin Cotrell, Amanda Crew, Brian Geraghty, Seth Green, Ashley Judd, Joe Pantoliano and Ray Liotta. The Identical was written by Howard Klausner, who also produced alongside Matt Russell, Joe McDougall, Coke Sams and Clio Tegel. Vision Films represents the film both internationally and domestically, and will have a special screening Friday, November 8th at the Ocean Screening Room in Santa Monica at 3:00pm. Identical twin brothers (both played by Blake Rayne) are separated at birth during the Great Depression. Their parents (Brian Geraghty, Amanda Crew) just cannot afford to give them both a life beyond poverty, so one is adopted by loving family. Despite their very different upbringings, the boys' shared passion for music causes their lives to unknowingly intersect as they experience a powerful and mysterious connection often felt by twins. 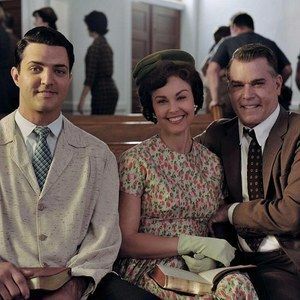 One of the boys becomes the most famous rock 'n roll legend in the world, Drexel Hemsley, while Ryan Wade struggles to find balance between his love for music and trying to please his evangelist father (Ray Liotta) and his devoted mother (Ashley Judd) who have very different plans for his life in the ministry. Ryan is encouraged by his wife Jenny (Erin Cottrell) and lifelong friends Dino and Avi (Seth Green, Joe Pantoliano) to follow his musical dreams. A timeless tale of love, hope, and redemption, it's a captivating journey about the restoration and the reconciliation of a family broken apart by culture, creed and tradition. The film features over 20 original songs in three volumes from the 50s, 60s and 70s with the soundtrack written and produced by Jerry Marcellino (producer of Michael Jackson, Diana Ross, v, Lionel Richie) and Yochanan Marcellino. With Jerry, Yochanan, Dustin and Jordan Marcellino, the film involved three generations of veterans of the entertainment industry. "The Identical is the complete package. Ray Liotta delivers one of the finest performances I have ever seen and Blake Rayne's voice is on par with the legends of the era." "The Identical is a family film for the ages. The uplifting story and music will warm your heart."